to the official site of LIRICA SAS! In 1988 the Ricaurte family embarked on a new adventure by introducing captive Crocodiles to their hot and humid family farm. With care and innovation Lirica has become a regional leader in raising Crocodiles and Caimans for their skins. Located in quaint Puerto Salgar, Colombia, Lirica provides quality raw salted Caiman and American Crocodile skins, 100% bred and raised at the farm. 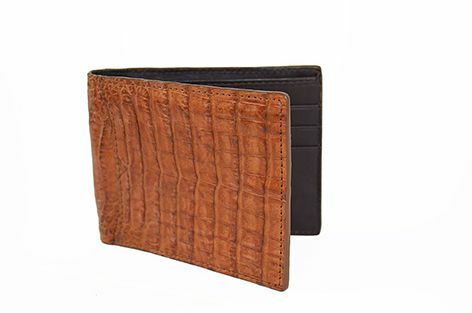 Lirica’s purpose is to become the most preferred supplier of Cayman and Crocodile skins worldwide by focusing on its main pillars; top quality, customer service, animal welfare, employee satisfaction, and environmental sustainability. Improve the existing facilities for each growth stage so that the animals are healthy, the employees are safe, and the end-product is unblemished. Adapt to customer needs not only in terms of skin properties but also, environmental permits, inventory management and shipping logistics that lead to long-term business relationships. Empower employees to achieve the long-term objectives of the company, working as a team and with opportunity for personal and career development. Protect the environment through a 100% closed breeding cycle and a water recirculation system. Ensure honesty and transparency towards regulation authorities and stakeholders. Ensure honesty and transparency towards regulation authorities and all other stakeholders. Respect all members of the company’s community and the surrounding environment. Embrace quality as the corporate drive, aiming for excellence and improving in each and every step of the production process. Exceed expectations of customers by fulfilling orders as agreed, while offering outstanding quality and customer service. Pursue growth by research and development of better and more efficient procedures. LIRICA SAS is located in Puerto Salgar, Colombia. 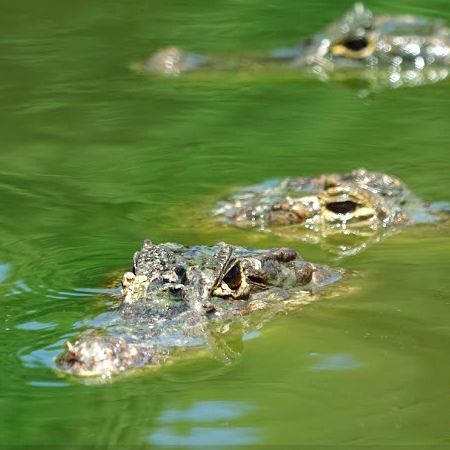 Nestled between two mountain ranges along the Magdalena river, the hot and humid climate make the farm-site the perfect environment for the farming of crocodilians. In 1988 the Ricaurte family embarked on a new adventure by introducing Caymans to a designated area in their hot and humid dairy farm and built the first adult enclosures. In 1991 the Ricaurte’s decided to expand into American Crocodyles and obtained the permit to capture their first breeders. Currently, Lirica has a livestock population of more than 100,000 animals. The animals are born and raised under our closed breeding cycle. The eggs are carefully collected from its own breeders and then sent to the incubation chambers. Once the newborns hatch, they are nurtured and passed along the farm’s growth stages (neonatal, nursery, pre-juveniles and juveniles). This currently gives Lirica a production capacity of over 40,000 quality skins per year in a wide variety of cuts and sizes. 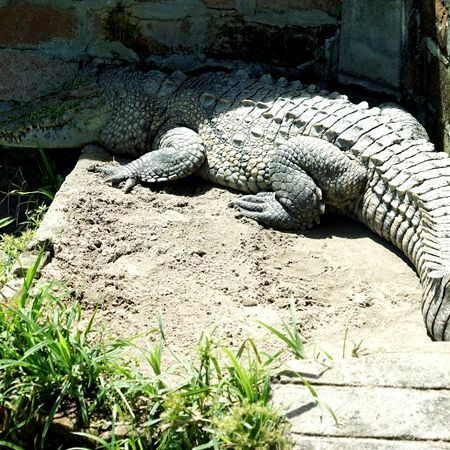 Lirica SAS complies with all the local and international regulations to commercialize its raw/salted skins of Caiman Crocodile and American Crocodile. All skins are shipped with its proper tags and certificates to guarantee its authenticity and legitimacy. Lirica is certified by ANLA - Autoridad Nacional de Licencias Ambientales at a local level and by CITES (The Convention on International Trade in Endangered Species of Wild Fauna and Flora) at a global level, as a “closed cycle” farm authorized to commercialize both Cayman Cocodrilus Fuscus and Cayman Acutus raw, in crust and finished skins globally. We understand that the basis of our business relies on the environment and its wildlife. 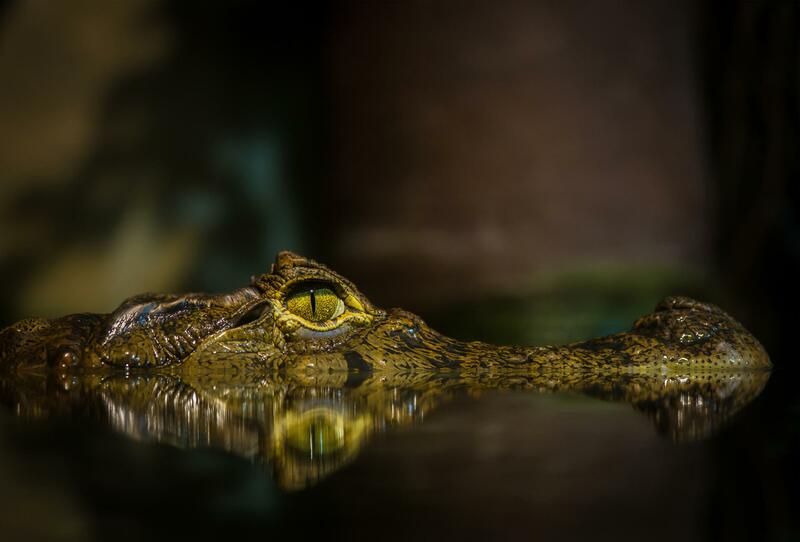 Currently the American Crocodile is listed in CITES Appendix 1 which means the species is threatened with extinction and so its trade is permitted only to certified farms that proof to do no harm to the wildlife population with its activity. The Caymans are not considered in so much risk but they are still Appendix 2, which includes species not necessarily threatened with extinction, but their trade is monitored to avoid utilization incompatible with their survival. Lirica SAS operates as a closed cycle captive breeding farm which has been established without detriment to the wild population. Furthermore, Lirica gives back 5% of the farm’s hatchlings to the local authorities. This is designated to either projects of the local authorities to study the species and its habitats, or for repopulating designated areas. Additionally, Lirica has its own water treatment plant, in which the solids are reduced and microorganisms remain in the water with the objective of recycling this precious resource for future processes. Furthermore, all organic solid waste is collected and taken into the composting facility, which through natural decomposing process, waste is further processed and used as fertilizer. Lirica has all the proper facilities to ensure an organized line of production that allows the crocodile farming process to flow all the way from the breeders to the raw/salted skins, guaranteeing optimum skin conditions for skin tanning. 8,000 Cayman breeders are divided into 17 lagoon closures. 350 breeder are, distributed in 19 breeding closures. During breeding seasons, our experts manually collect the eggs from the nests. Nests are placed into specially designed containers and preserved under strict incubation parameters to assure a healthy development of the embryo before hatching. The water used to raise and grow the crocodiles is collected in a treatment plant, where it is treated through natural flocculation, aeration, and filtering processes to remove the content of solids and microorganisms to recycle water for future productions. Where all the organic waste is processed and transformed into a natural fertilizer. 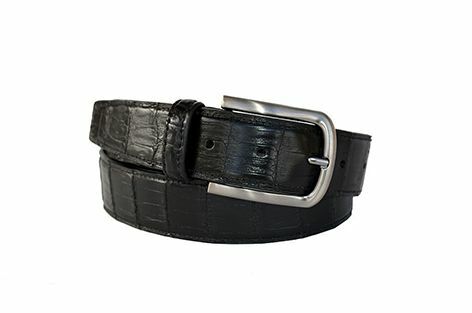 This type of caiman species belongs to the reptile alligatorae crocodylians family, under the caimaninae subfamily. Its habitat includes most of Central and part of South America, mainly in tropic humid regions. CITES Position: Appendix II (see Article II, paragraph 2 of the Convention). Grade Selection: First, Second & Third. Depending on the size range selected. Follow link to see grading standards. Price unit: Lineal Centimeters, width measured over a flat surface without stretching, at the 8th scale of the vest, all along the skin from end to end. 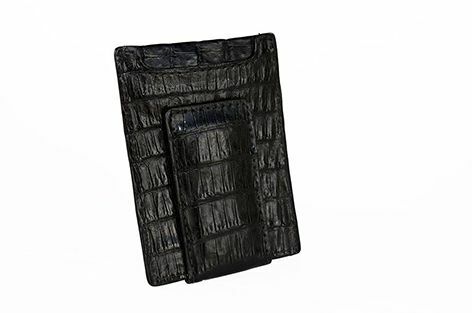 Typical Product Usage: Finished Caiman Crocodile Fuscus skins are used to manufacture luxury handbags, clutches, wallets, belts, watchstraps, shoes, boots, accessories, and other leather products. Packaging: Raw/salted skins provided by Lirica are properly fleshed, treated with a special antibacterial, salted and packed by groups inside plastic bags. This prevents decomposition of the skins during transit and ensure skins arrive to its final destination in optimum conditions ready for tanning process. 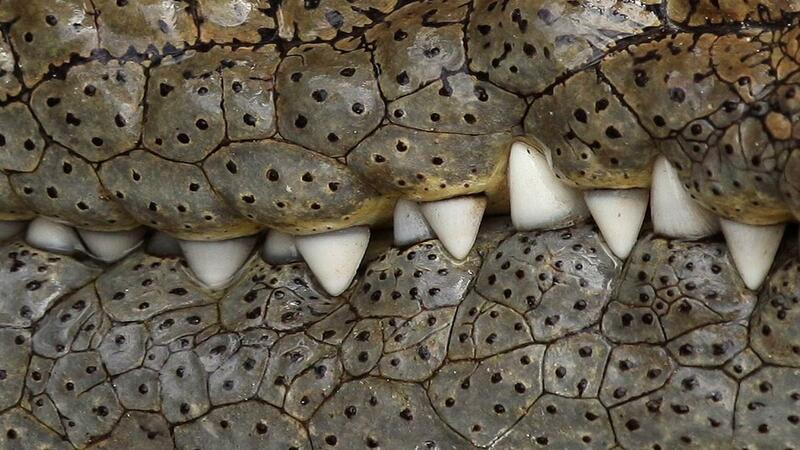 This type of crocodile species belongs to the reptile crocodylians family. Its habitat includes most of Central and part of South America, mainly in tropic humid regions. CITES Position: Appendix I (see Article II, paragraph 1 of the Convention). IUCN Red List Status: Vulnerable A1ac ver 2.3. Cuts: Belly, Hornback and Jersey. Grade Selection: First, Second, Third & Forth. Depending on the size range selected. Follow link to see grading standards. Belly: Lineal Centimeters, width measured over a flat surface without stretching, at the 8th scale of the vest, all along the skin from the first middle bone to the first middle bone. Hornback: Lineal Centimeters, width measured over a flat surface without stretching, at the 8th scale of the vest, all along the skin from end to end. 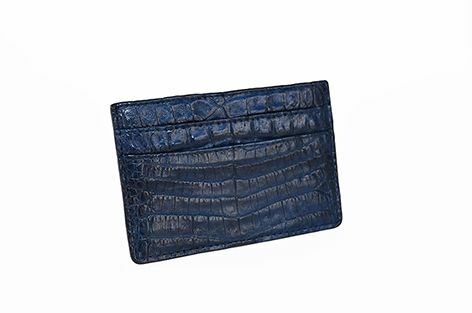 Typical Product Usage: Finished Crocodile Acutus skins are used to make top luxury handbags, watchstraps, shoes, boots, wallets, belts, accessories, garment clothing, luggage, upholstery, among many other leather products. With the objective of helping the environment and wildlife in Colombia, Lirica offers quality finished products at wholesale prices directly to the end customer. In which 5% of the total farm production is destined to promote environmental projects managed by regional environmental authorities. Size availability: 30 – 44 inches. Sizing measured from the end of the belt (without buckle) to the middle whole. Hardware: Wide availability of high end zamac hardware styles in Gold and Silver. Lining material: Genuine cowhide leather, tone to tone. Additional charges may apply if different width, size or hardware is required. Dimensions: H:8.5 x W:21.5 cm / H:3 3/8 x W:8 3/8 inches. Lining: Nappa cowhide leather, tone to tone or different if needed. Cash compartment material: Acetate fabric. 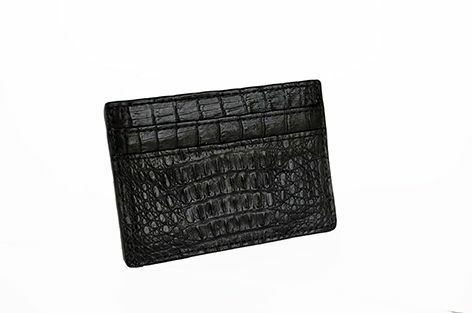 Services: 2 cash compartments, 6 credit card slots and 2 internal side pockets. Dimensions: H:14 x W:20.5 cm / H:5 1/2 x W:8 inches. Services: 1 passport slot and 1 credit card / 1 boarding pass slot. Dimensions: H:8 x W:21 cm / H:3 3/16 x W:8 1/4 inches. Cash money clip in silver or gold. 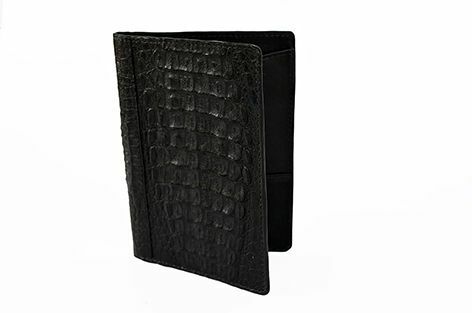 Services: 1 cash money clip, 6 credit card slots and 2 internal side pockets. Dimensions: H:7 x W:10 cm / H:2 3/4 x W:4 inches. 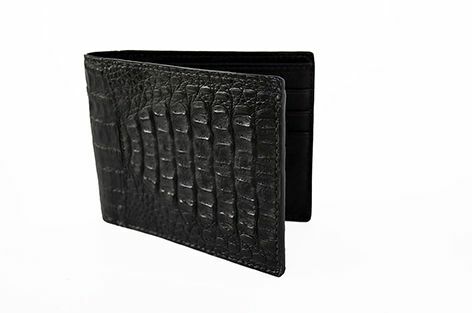 Services: 4 credit card slots and 1 top pocket. Services: 3 credit card slots and 1 magnetic cash holder. Small: H:8.5 x W:2 cm / H:3 3/8 x W:13/16 inches. 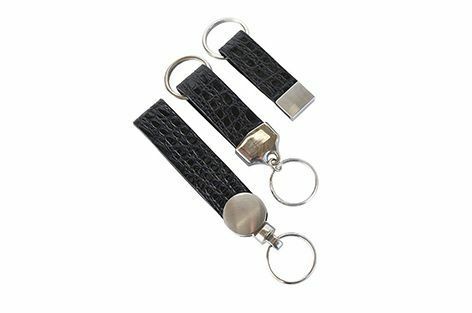 Medium: H:13 x W:2.5 cm / H:5 x W:1 inches. Large H:14.5 x W:2.5 cm / H:5 3/4 x W:1 inches. Hardware: High end zamac hardware styles in Silver. 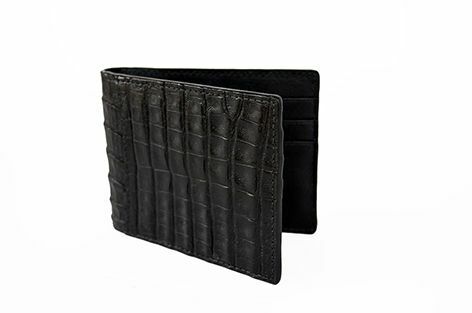 Lining material: Genuine cow hide leather, tone to tone. Additional charges may apply if different hardware is required. Dimensions: H:10 x W:7 cm / H:3 7/8 x W:2 3/4 inches. How does Lirica certifies that its skins are authentic and come from farm raise animals? All skins supplied by Lirica are shipped with its CITES tags and CITES Certificate, which guarantees that skins are authentic and come from farmed raised animals. Does Lirica require a minimum quantity per order? Yes, the MOQ required is of $5,000 USD per order. Which shipping method is used? Generally, all skins are shipped by air. Can Lirica provide contract tanning services? Lirica may offer tanning services to special clients on frequently sales program. For further information, please contact us and send us your order requirements. What are the foundations of a “closed production cycle” crocodile farm? A closed production cycle crocodile farm is based on the principle that its production its 100% sustainable, in the sense the farm has its own breeding capacity where eggs are collected, nurtured in incubation rooms, cherished throughout the farm’s growth stages and finally selected either for to be sacrificed or repopulate breeding inventories, without affecting the natural wildlife reserves of the species being produced. Furthermore, one must know that Colombia in one of the few countries in the world with closed production cycle crocodile farming. To place orders of Caiman Crocodile and American Crocodile raw/salted skins, please contact us and send us your order requirements. What are the time frames for Lirica to deliver an order? As long as skins are available within the company’s livestock, the lead time for Lirica to have skins ready to start shipping process is generally between 30-45 days. Big orders can take up to 60 days. What suggestions does Lirica have about raw skins storage and handling? After fleshing and packaging process, it is recommended that skins/packages are maintained under a dry and cold environment; preferably of maximum 40% of humidity and temperatures between 5-10 degrees Celsius. Can Lirica provide manufacturing services? Lirica can provide manufacturing services. For further information, please contact us and send us your order requirements. 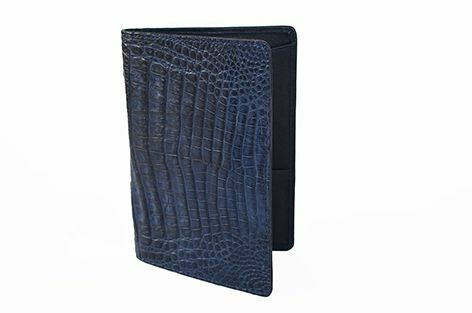 Where can I find information about local environmental permits and paperwork required to import/export exotic leather skins? A contact list of all national and regional authorities listed by counties can be found through the global entity which regulates the commercialization of exotic leather skins; The Convention on International Trade in Endangered Species of Wild Fauna and Flora (CITES).